Amity by Micol Ostow. Egmont USA. Reviewed from ARC; publication date August 2014. My Teaser from April. The Plot: Two families, years apart, move into the same house. A house called Amity. A house in the middle of nowhere. A house with secrets, dark and deadly. The Good: Amity is about a haunted house; a house that is both haunted and that haunts its unfortunate inhabitants. It is told by two seventeen year olds, Connor and Gwen. Both have just moved into a new house. It is the same house, ten years apart. And both see what those around them cannot, or will not: that there is something terribly wrong with the house. Something supernaturally wrong. As I said in the teaser, this scared the hell out of me. 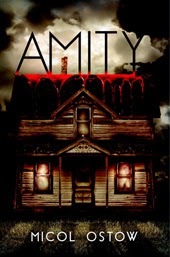 The title, Amity, refers to another story about a haunted house, The Amityville Horror. I read that original book at age thirteen, believing every word. Specific details have changed: the location of the house. The time period. The families. You don't have to read that book to "get" this one. That one book lead to several movies, several versions of the story, but all about a haunted house. "Here is a house of ruin and rage, of death and deliverance, seated atop countless nameless unspoken souls." Connor's story is the earlier story, when he and his siblings move into the empty house. Connor's family is one that looks so pretty on the outside (mom, dad, twins, little boy), much like the house they move into: "Probably from the outside it looked like we were doing better than we really were. That was Dad's thing -- make sure we looked like we were doing better, doing well." What scared me about Connor's story was not so much his realizations that something was wrong with his house, but that he welcomed that darkness -- that Connor came to Amity with something already missing from his soul. The present-day Gwen has a different set of problems than Connor, but part of those problems means that when she begins to see that something is wrong at Amity, people don't believe her. For Connor, the reader wonders how far he'll go; for Gwen, it's wondering whether she'll be able to stop history from repeating itself. And if she can, what will the cost be? I love how the stories went back and forth between Connor and Gwen. I loved the various references to the original story. I loved how isolated and strange Amity was, further isolating Connor and Gwen's families. And I loved as both madness and haunting settled into both timeframes, those times began to merge.